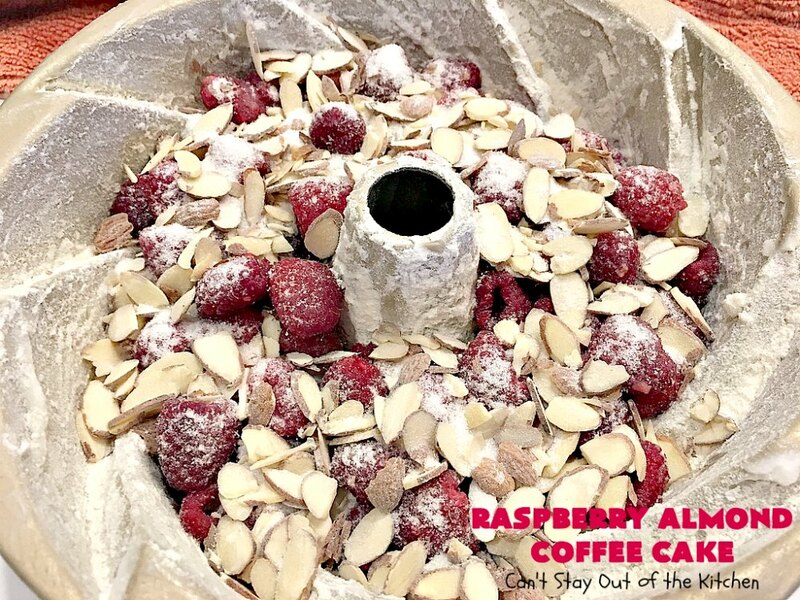 I love raspberries and Raspberry Almond Coffee Cake is phenomenal! 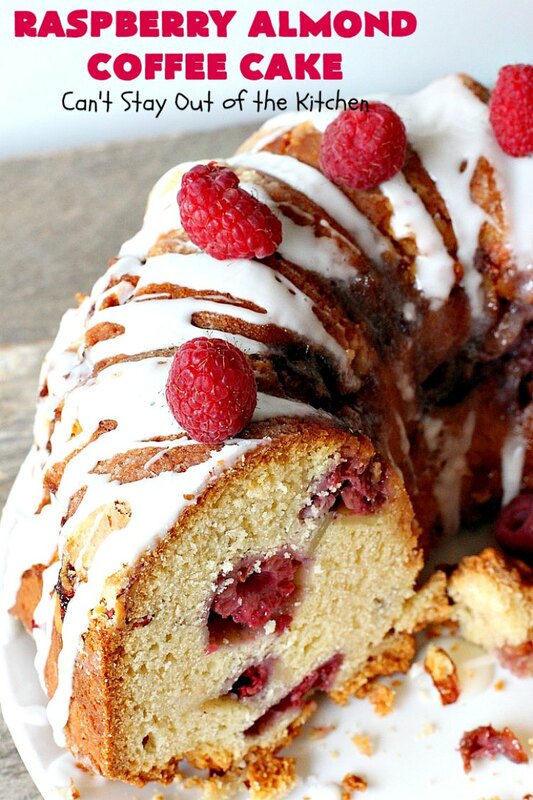 While raspberries aren’t the sweetest berry around they are delightful to eat. Nowadays you can get them almost any time of the year–not just in the summer. 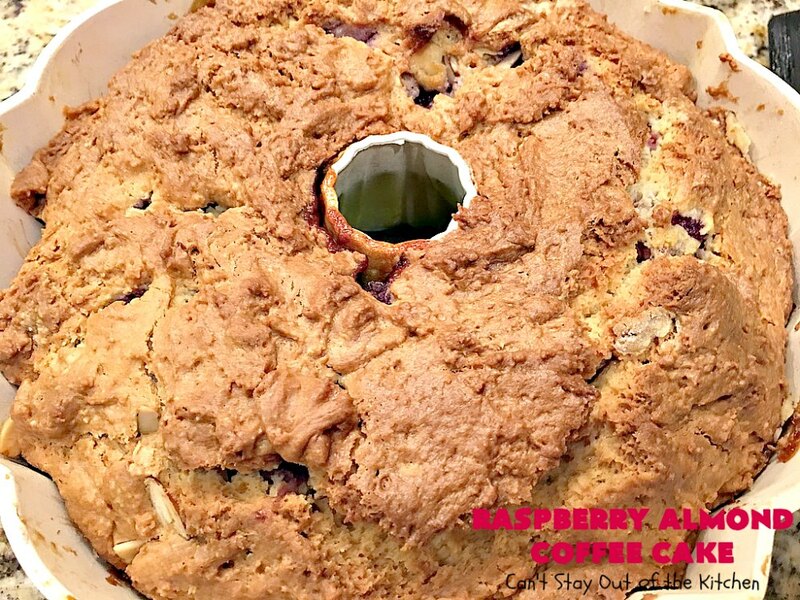 This delightful coffeecake is made with layers of fresh raspberries and has an almond streusel filling that’s layered as well. 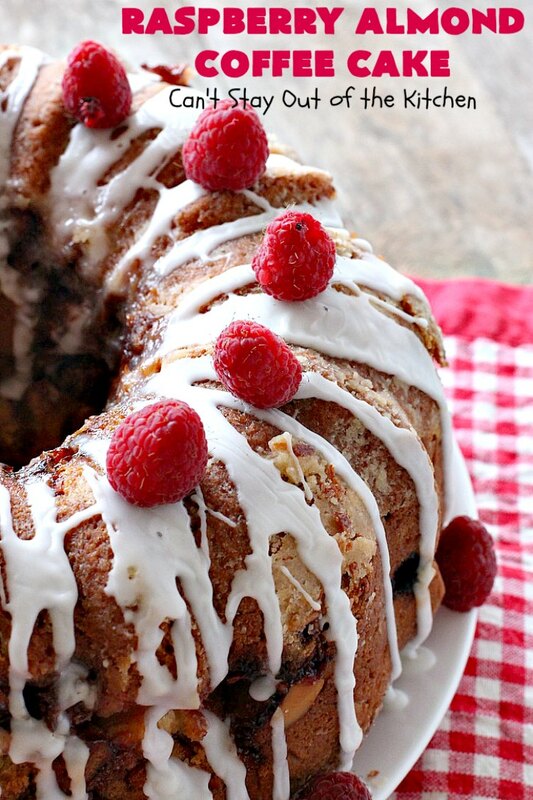 This coffeecake is heavenly. I have several versions of this amazing coffeecake and each one is tantalizing and so mouthwatering. Blueberry, Strawberry, Peaches ‘n Cream, Fresh Cherry are some of my favorites. But this is one of those coffeecakes that can be made with just about any kind of fruit. I will say you must use your largest bundt pan for this recipe. 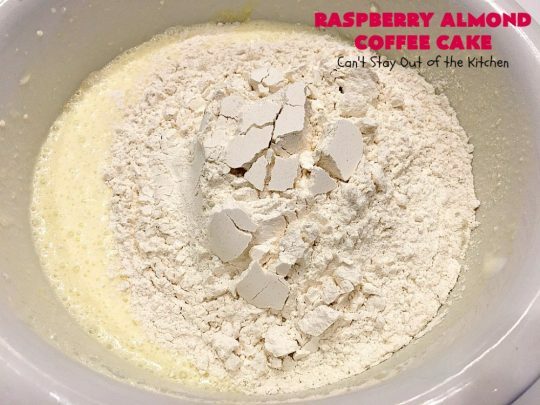 You also may want to put a pan underneath the cake pan while cooking to catch any drips while baking. Back in February I was coordinating meals for several homes in our church who were hosting youth for our Disciple Now Weekend. I gathered volunteers to make meals for different homes, but I also cooked for a couple of the homes as well. I made two of these coffeecakes. I made one for breakfast in one of the host homes and one for dessert in another. This amazing coffeecake got rave reviews. The biggest factor in baking bundt cakes is making sure you cook them long enough. I can’t stress this enough. 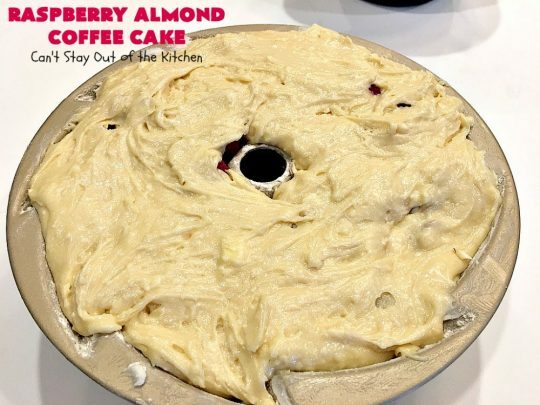 If you take the cake out five minutes too early it won’t be baked all the way through and the cake will come out in clumps. (Take it from someone who knows). 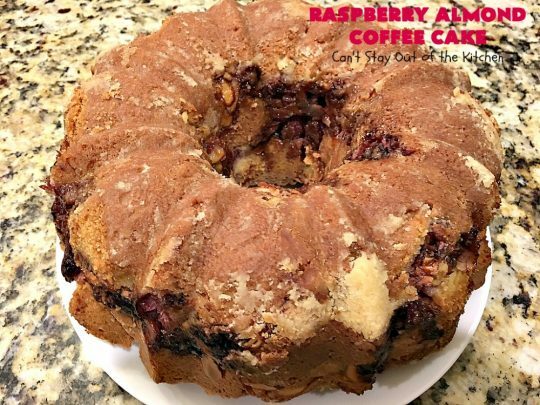 🙁 This particular coffeecake because it’s so deep and filled with so many ingredients takes about 1 1/2 hours to 1 3/4 hours to be baked completely. 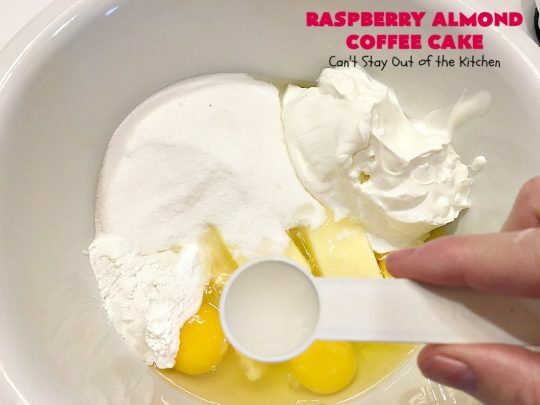 Insert a knife into the center of the cake ALL the way to the bottom. Only when the knife comes out totally clean is the cake done. I have never had one of these cakes cook more quickly than about 1 hour 15 minutes. However, because every oven is different and some cook more quickly, you should start checking at around an hour. After that, check every 15 minutes until absolutely no goop is left on the knife when done. 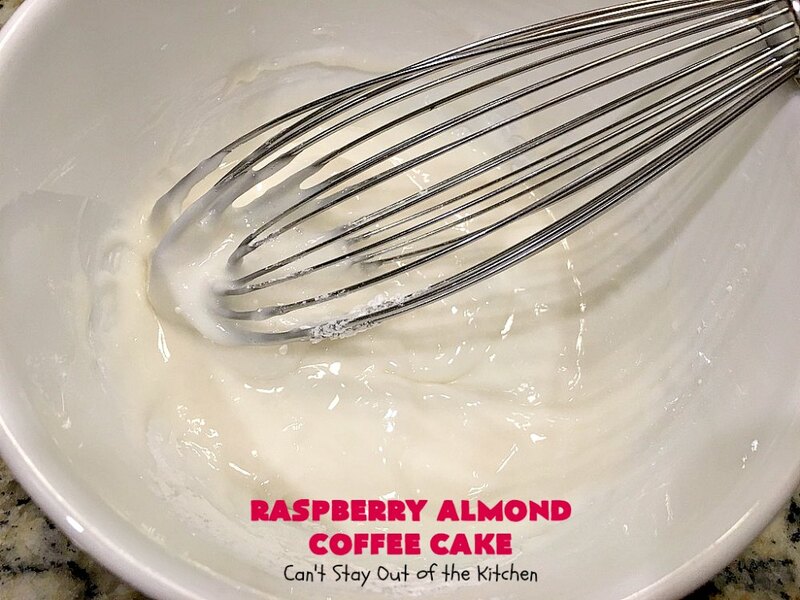 Raspberry Almond Coffee Cake is awesome. 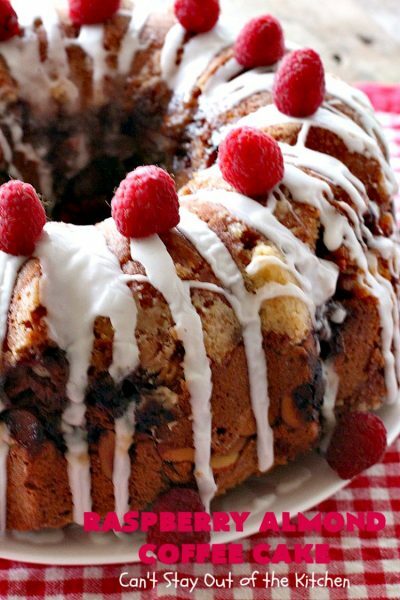 This cake is terrific for holiday breakfasts like Easter, Mother’s Day or Father’s Day. But because raspberries can be purchased all year round these days, this is also great for Thanksgiving and Christmas breakfasts. This festive cake is delightful for Valentine’s Day too! 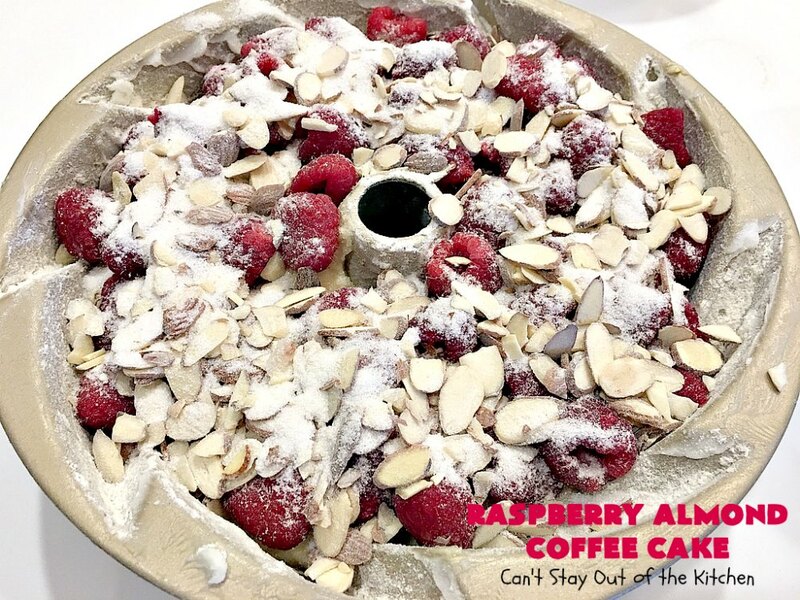 Every bite of Raspberry Almond Coffee Cake is delightful. Put sliced almonds, flour and sugar in a bowl. Soften butter. 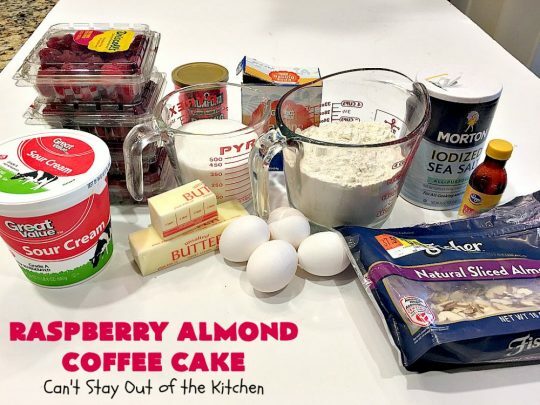 Add sugar, sour cream, eggs, almond extract, baking powder, baking soda and salt. 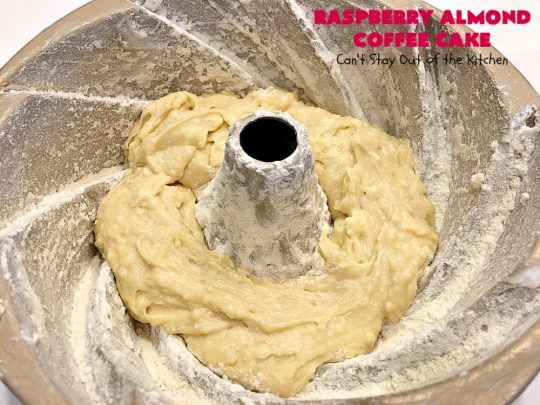 Add unbleached flour. Bleached flour toughens baked goods. Grease and flour a bundt pan extremely well. Spoon one-third of the batter into the bottom of the prepared bundt pan. Spoon half of the raspberries on top of the batter. 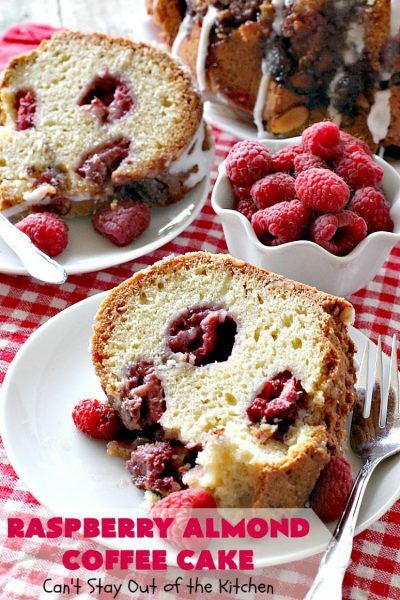 Sprinkle half of the almond streusel layer on top of the raspberries. Spoon another third of the batter over top of the almond layer. Add remaining almond streusel layer. Top with remaining cake batter. Bake at 350 for 1 1/2 to 1 3/4 hours or until a knife inserted in the center comes out totally clean. Cool cake completely. Invert onto plate. 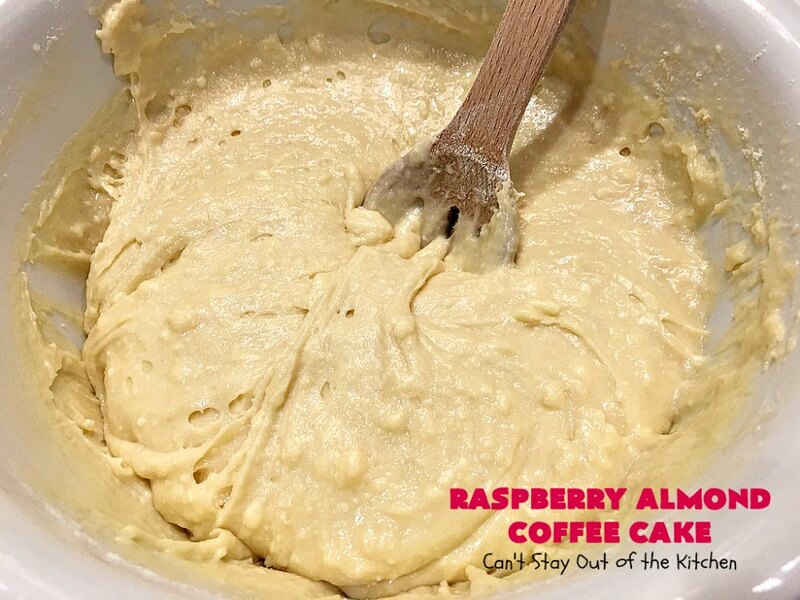 Drizzle glaze over top of cake and allow to set about 15-20 minutes before serving. Serve Raspberry Almond Coffee Cake with fresh raspberries for a delightful holiday or company breakfast! If you enjoy raspberries, you’ll love this coffeecake. 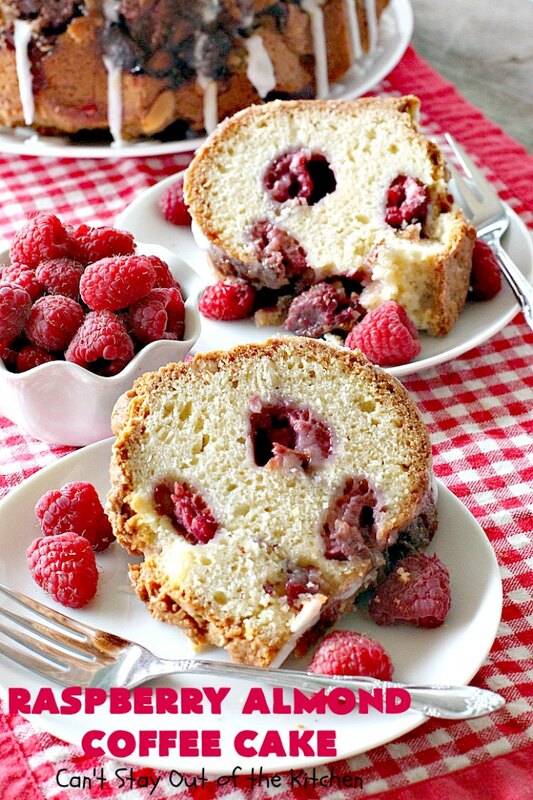 This cake is filled with two layers of raspberries and almond streusel filling. 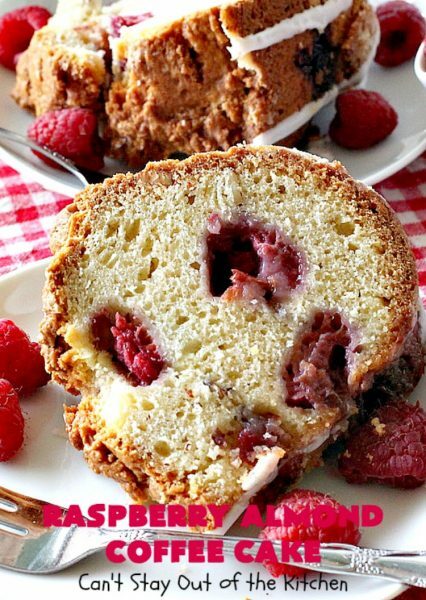 Plus, the almond extract in the batter provides additional almond flavoring that’s heavenly. Raspberry Almond Coffee Cake is a heavenly cake made with layers of raspberries & an almond streusel filling. 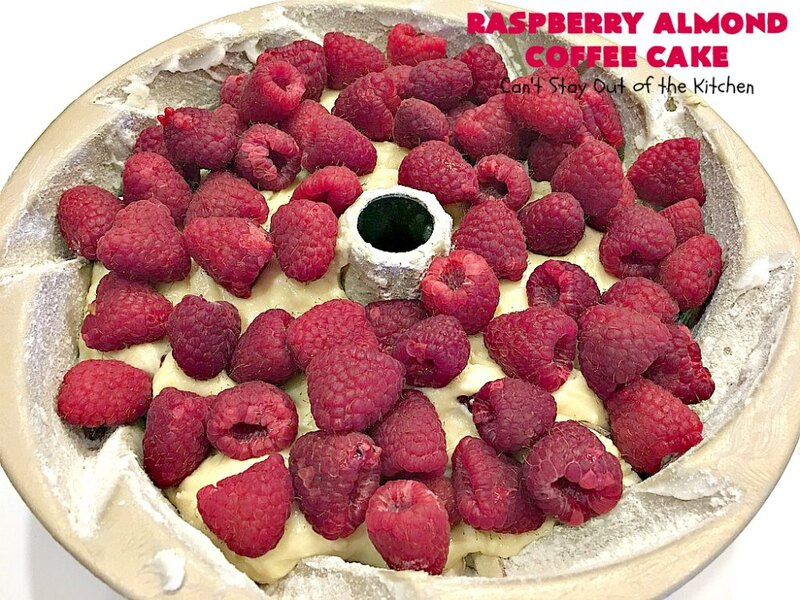 It's perfect for holiday breakfasts like Easter, Mother's Day or Father's Day. It's also terrific to serve as a dessert. 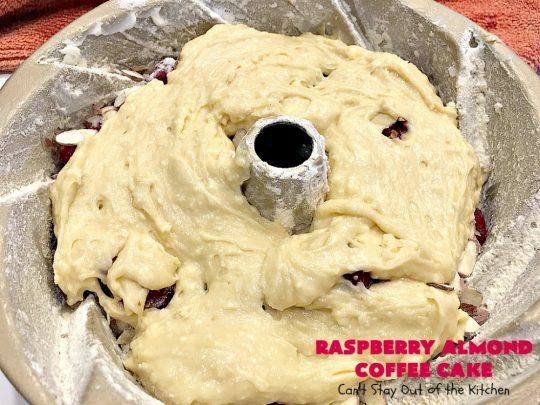 Generously grease and flour a 10- or 12-inch bundt pan. 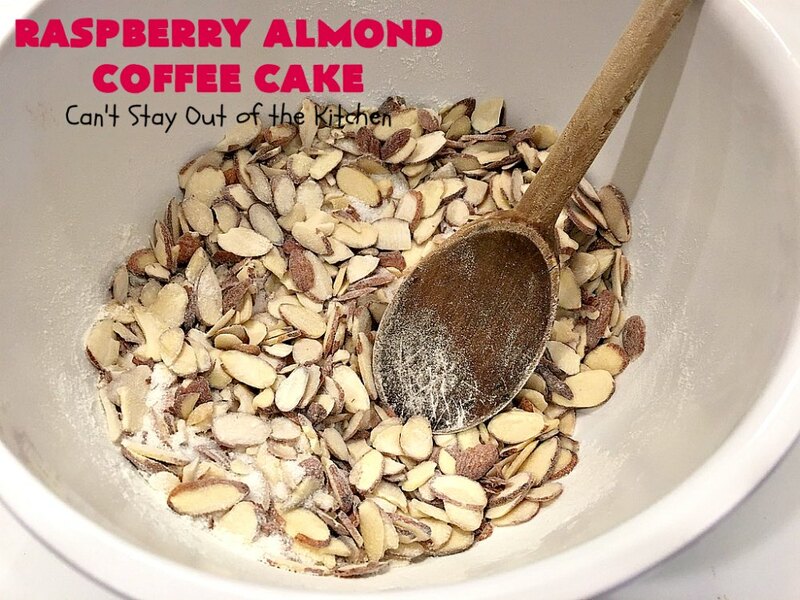 In small bowl, combine ¼ cup white sugar with 1 heaping tablespoon flour and sliced almonds; mix well. 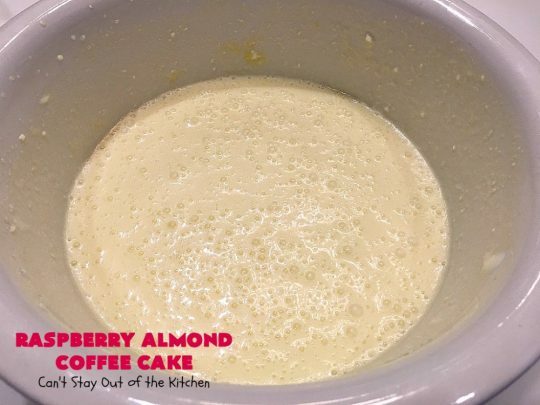 In a large bowl of electric mixer, at medium speed, beat butter, remaining 1 ½ cups sugar, almond extract, eggs, baking soda, baking powder, salt and sour cream. Stir in flour with a wooden spoon to combine well. Turn one-third of batter into prepared pan, spreading evenly. 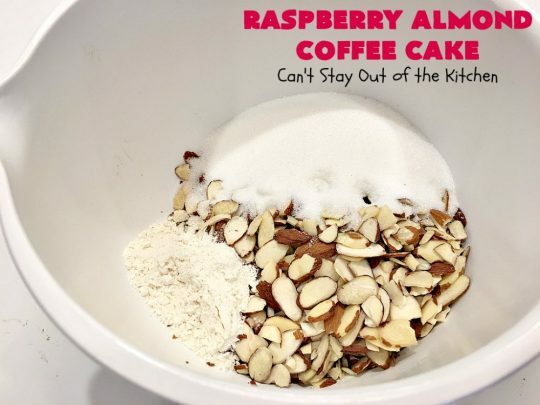 Sprinkle with half the raspberries and half the almond mixture. Repeat layering of remaining batter, raspberries and almond mixture. Finally top with last third of batter and smooth the top. Bake 1 ½ to 2 hours, or until knife inserted in center comes out clean. Cool in pan on wire rack 20 minutes. 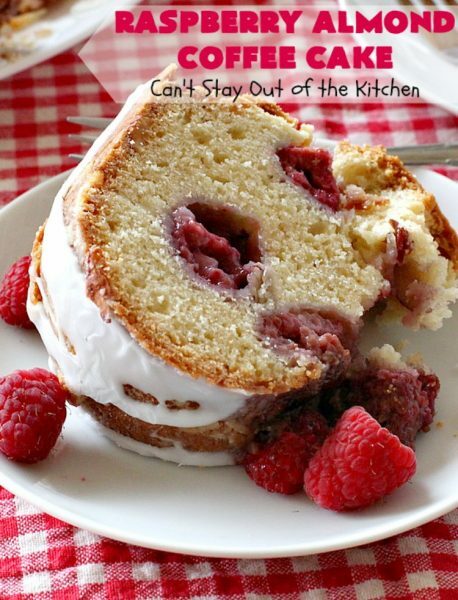 Gently remove cake from pan. 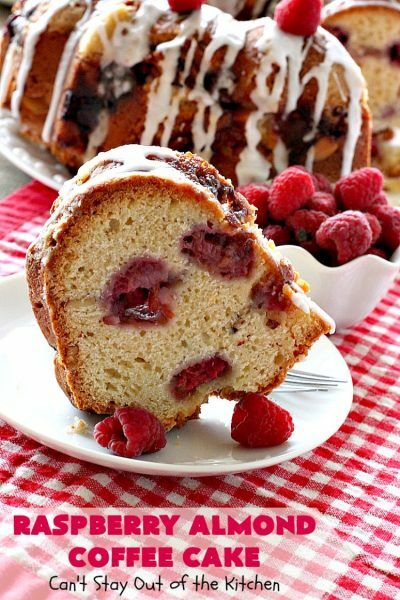 Mix powdered sugar and milk until smooth; drizzle over cake. NOTE: You will need your largest bundt pan to make this recipe. You may want to put a cookie sheet under the rack with the bundt pan to catch drips. 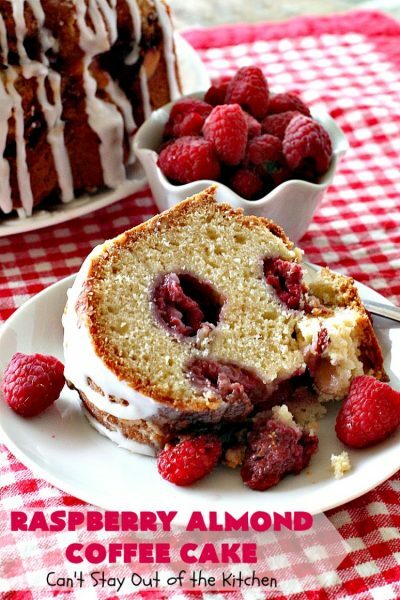 NOTE: I cannot overemphasize enough the need to bake this cake until it is thoroughly done. Some ovens may take as long as 2 hours. Until the knife inserted in center comes out totally clean, the cake is not done. It will come out in clumps unless it is cooked completely. 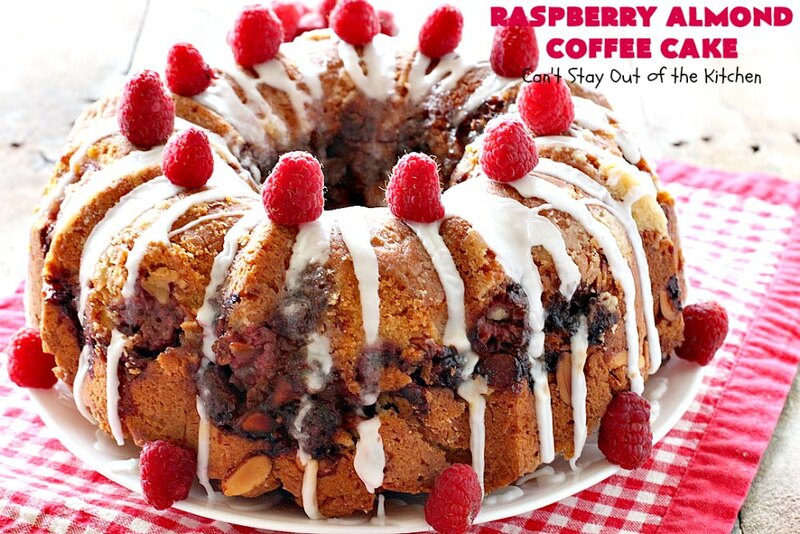 I’ve always enjoyed coffeecakes and this one is fantastic. Raspberry Almond Coffee Cake is great for dessert too. 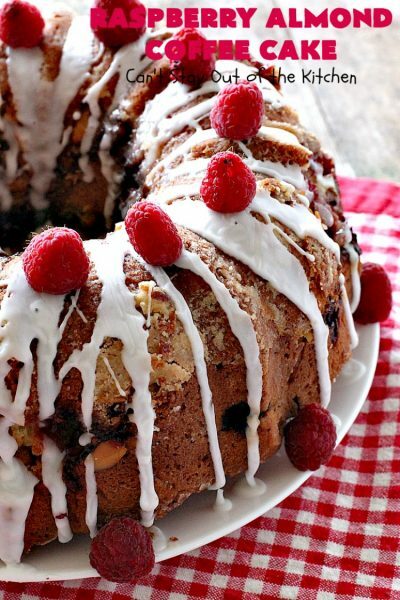 If you have a sweet tooth, this amazing cake will satisfy any sweet tooth craving! 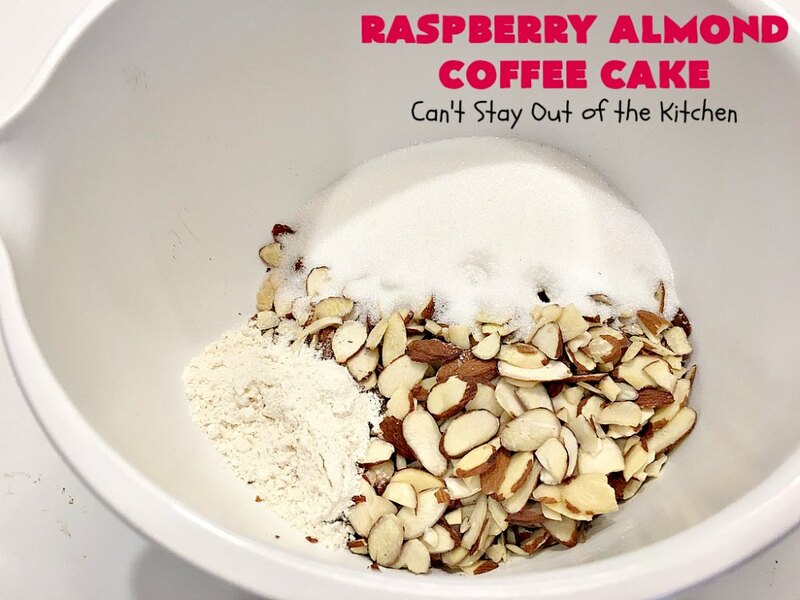 Raspberry Almond Coffee Cake is a sure bet. 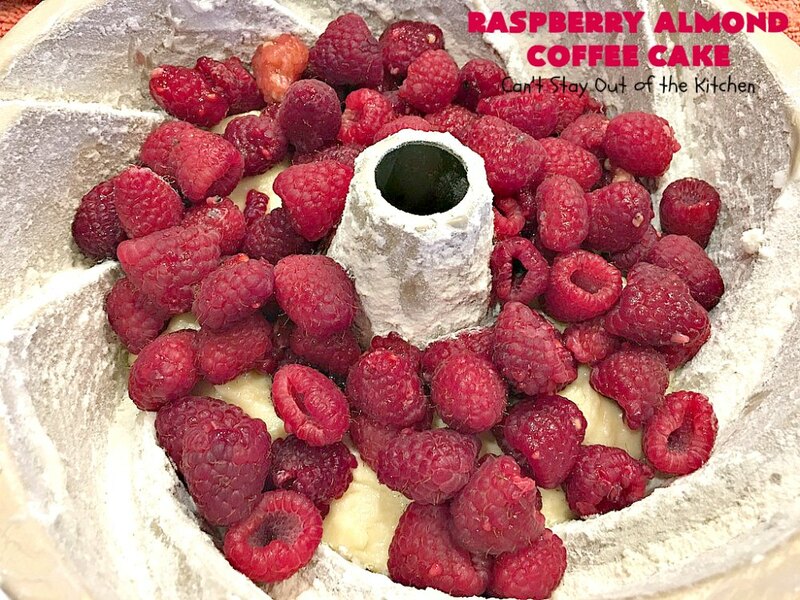 Everyone will love this cake!